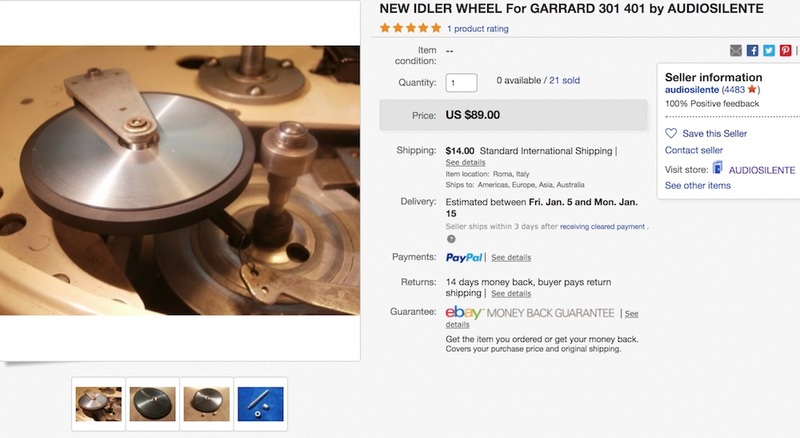 Spotted on eBay: a replacement idler wheel for my Garrard 301. Well, reading the description, not only a replacement but an upgrade as well. This because of improved design and better materials being available compared to 50 years ago. At least, that is what Audiosilente suggests in the item description. Some Youtube movies have been posted as well showing the difference between the original idler wheel and theirs. Post on eBay, they sell very quickly.. But when is replacement necessary? I mean, if you spin the original wheel and it keeps running for a very long time, is replacement necessary? 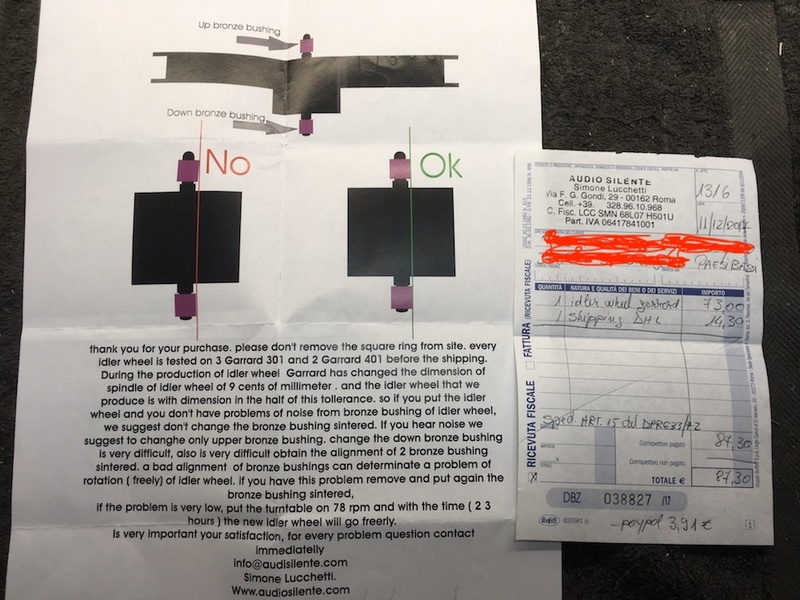 Or has it to do with tolerances on the bushings? Or maybe both? If the wheel has some lateral movement, that is if you can uplift the wheel just a bit by the rubber edge, tolerances are not within specification anymore. If this is the case, the bushes are a bit worn and that is no wonder since they have been there for 50 years. Yes, it will spin for a very long time when oiled because there is plenty of room for movement. But you can imagine that that besides rotation any other movement is unwanted. Also if the wheel is not spinning quite happiliy for more than 10 seconds, something is wrong and the motor has to work really hard to keep it going. Last reason for replacement might be when the rubber outline of the wheel is not perfectly round anymore or dried out and has cracks. So in my case there was some lateral movement and I ordered one for replacement. Not an original one but this one from Audiosilente because of their improved design, included replacement bushes and a tool for replacing those! Delivery took only a few days throug DHL, nice! 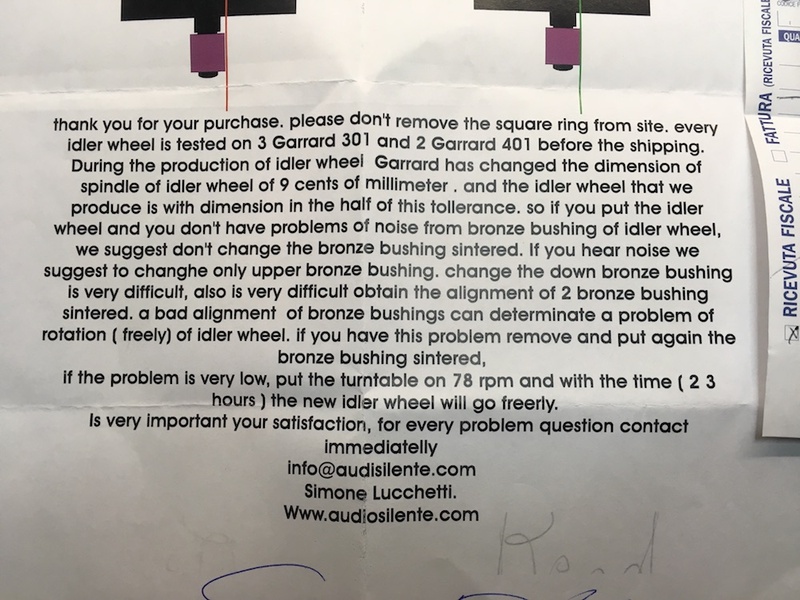 Included in the package there was a little note indicating that Garrard used different diameter wheel-spindles throughout the years, and that Audioliente settled just in between these (minor) differences for their idler wheel. Actually, that meant for me that a full replacement of wheel and bushes was mandatory in order to get the tight tolerances as described. Certainly not to go for the option to keep the lower bushing and replace only the upper one.. The included note with Italian English, somewhat different from my Dutch English.. Replacing the bushes meant I had to remove the 301 chassis from the plinth, this to reach the lower arm holding the idler wheel in which a spring washer had to be removed to be able to remove it. The original drawing, the exploded view, with anannotation on the lower arm. 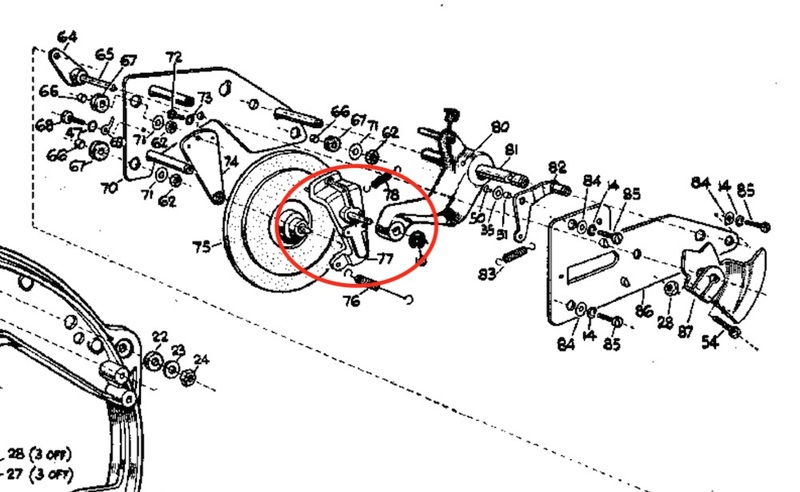 As you can see in the drawing, the bushing in the lower arm is supported by a metal plate (77) that is riveted to the arm. To be able to remove the bushing without removing that metal plate, it had to be threaded and removed by a puller. 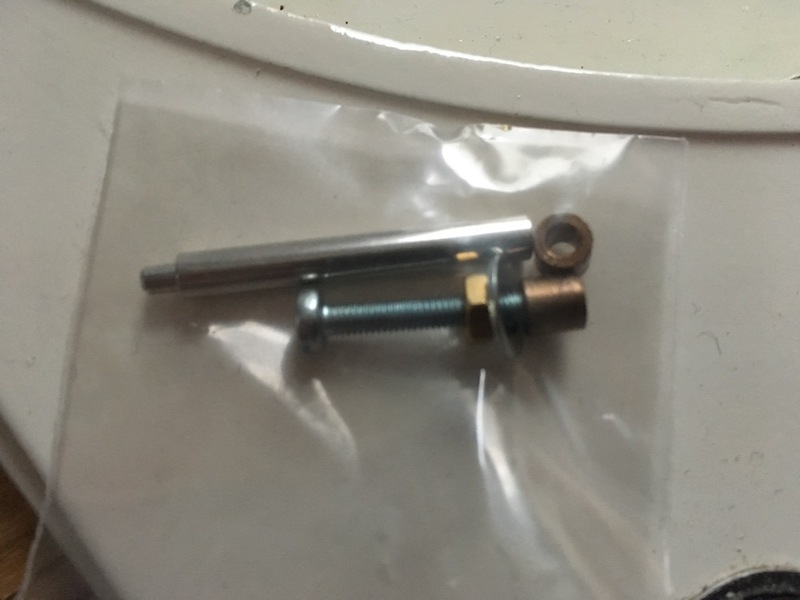 An M3 bolt was put in and with the use of some whashers I was able pull out the bushing without having to remove the small riveted metal plate. Note December 29 2017: On Facebook Jaap Pees from Hanze Hifi pointed out that the metal plate actually is a thrustplate. 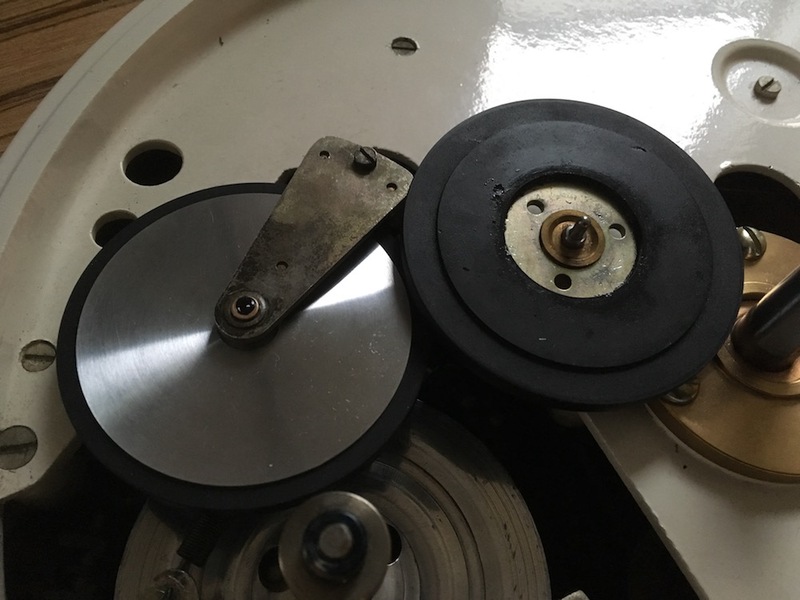 This is his advice: "Best to remove the metal trustplate because there is a small wear dent in it.Then turn it over and fix it with two small M2 bolts." For the bushing in the upper arm, the supplied tool worked like a charm. Mounting the new bushings was easy by gently tapping them in, using the supplied tool and a light hammer. A testrun with the new idler wheel confirmed everything was running freely, although it did not run as long as the older one did. Tolerances however where fine and the 301 could be put togeter again and mounted in the plinth. The home made puller for removing the lower bushing, a M3 bolt with nut in the threaded bushing. When everything was put together and oiled, it was time for a first testrun. And that was a bit of a disappointment, to be honest. Since the platter did not start by itself, I had to give it a swing and after that it did not reach the 33.3 rpm needed. Why? Could it be my oversized and heavy Classic-Hifi platter? It did not.. As it turned out, it just needed some spinning time to run in. Leaving it running for only 10 minuted resulted in being able to reach the 33.3 rpm by increasing the frequency a bit using my external powersupply. And a few hours of spinning later, I had to cranck it down and below the speed needed with the original idler wheel. So, not only more efficient to reach the required speed, but also noticably lower noise on the wheel. Nice again! Well, yes. Yes! Garrard is famous for energy and drive and pace and rhythm due to its' idler-drive. Reviving that idler-drive revives that character as well. 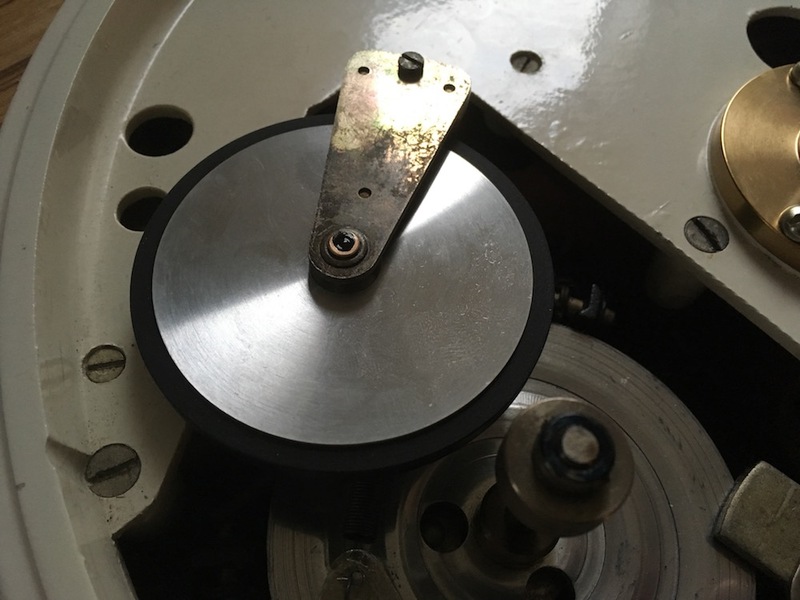 The improvement got to have to do with better stability for the idler wheel and more firm grip between idler wheel and platter. Energy transfer between motorpully and idler wheel is better as well, resulting in more stable drive of the platter and because of that firm grip as well. It is like the old Garrard got a bloodtransfusion! Since there was some slack on the old bushings, for me it is hard to point out if this is due to replacement or the improved Audiosilente design. Who cares? This is an awesome improvement which I recommend to every idler-drive turntable owner. For me the supplied tool is a match winner over original parts.. The Audiosilente idler wheel in place..